Brain Freeze - ZineWiki - the history and culture of zines, independent media and the small press. 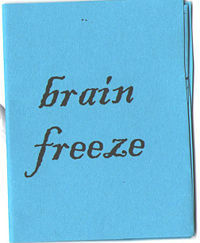 Brain Freeze is a micro zine created by Kari Tervo. It was published in California, U.S.A. in January, 2014 as part of a Micro Zine Swap managed by zine-maker Deirdree Prudence. It is 16 pages and printed on blue paper. Tervo explains in the introduction that this zine is called Brain Freeze because "it's stuff my brain conjured up when I was just chilling out, not thinking too hard." Brain Freeze is Tervo's first micro zine. Content includes light-hearted doodles, phrases, photos, poetry, and art. In February, 2014, Deirdree Prudence wrote about Brain Freeze, "This zine made my side hurt. Leave it to Kari to make me literally giggle aloud." Etsy user pinktoyballoon posted in February, 2014 that she "sincerely enjoyed this lovely micro zine." This page was last modified on 25 April 2015, at 23:08.